Earlier this month, Tasmanian author Richard Flanagan was named the winner of the Man Booker Prize 2014 for his novel, The Narrow Road to the Deep North. The Man Booker Prize is a prestigious literary award open to all books published in English in the UK that year; until this year, it was only open to authors from Britain or the Commonwealth, but the rules have now been changed so that authors may be from any country. Other Australian authors who have won the Man Booker are Thomas Keneally, for Schindler’s Ark, Peter Carey, for Oscar and Lucinda, and The True Story of the Kelly Gang, and DCB Pierre, for Vernon God Little. 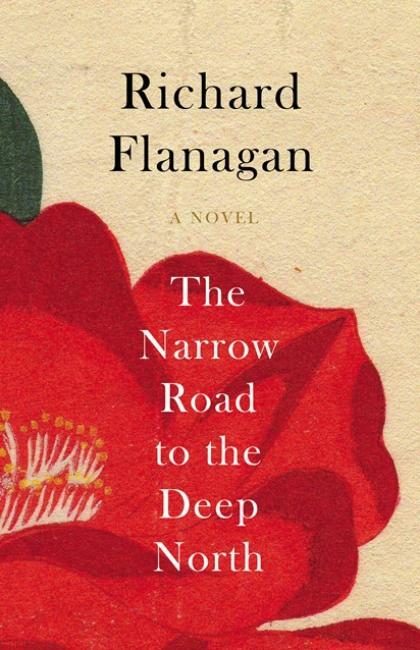 The Long Road to the Deep North is Richard Flanagan’s sixth novel, and an epic work of historical fiction. At its heart is the story of the Burma Railway during World War II, and the prisoners of war who suffered as forced labour to build it. The novel’s protagonist is a Tasmanian medical officer, very loosely modelled on military surgeon Colonel “Weary” Dunlop, who becomes a celebrated war hero, but feels doubtful and ambivalent about his fame; he is also haunted by a wartime love affair which he believes ended in tragedy. The novel’s title is taken from a famous 17th century haibun (journal in prose and haiku) by Japanese poet Matsuo Bashō. Richard Flanagan’s father Arch was a Japanese prisoner of war, one of the legendary group led by Weary Dunlop who lived and died on the Burma Railway (he has written his own book on the subject called The Line, with another of his sons, sports journalist Martin Flanagan). For more than a decade, Richard felt that The Narrow Road to the Deep North was the novel he needed to write if he was going to continue writing. He wrote five different versions, until he realised that Arch, now in his nineties, was growing frail, and determined to complete the novel before his father died. Richard drew on many of his father’s memories and experiences, and just before Anzac Day was able to tell his father that he had finished writing the book; that night Arch passed away. The Narrow Road to the Deep North is dedicated to “prisoner san byaku san ju go” – Arch Flanagan’s Japanese prison number, 335. Winning the Man Booker has made a big difference for Richard Flanagan. Despite reviews describing it as “haunting and evocative“, and imbued with “extraordinary power“, the week before the Man Booker Prize the novel sold just over 300 copies in the UK. The week after winning it, The Narrow Road to the Deep North sold more than 10 000 copies. The £50,000 prize money will allow Richard to keep writing, because before the book was published, he was considering going to work in the mines up north to earn money to live on. The central character of The Narrow Road to the Deep North is named Dorrigo Evans (christened Alvyn). Many of the novel’s characters have unusual names: Sheephead Morton, Chum Fagan, Yabby Burrows, Gallipoli von Kessler “Kes”. Richard Flanagan says simply that he “made them up“, and that the characters just didn’t work until he got the names right. He also uses a line from Tennyson’s Ulysses: “I am become a name”. The name Dorrigo barely stands out in such company, and these are colourful Australian war era nicknames, with the reasoning behind them not always immediately obvious. Weary Dunlop himself had such a moniker, gained while at medical school. His first name was Ernest, and he went by his middle name of Edward – so why was he “Weary”? Because of his surname Dunlop, and Dunlop tyres: he was a Dunlop, so he must always be “tired”. Dorrigo (pronounced DOR-ih-go) is in northern New South Wales. It’s an attractive small country town in an exceptionally beautiful natural setting; the heritage-listed Dorrigo National Park is right near the town with rainforest, waterfalls, stunning views,and a host of bird-life. Dorrigo has a thriving community, and a few years ago the townspeople showed they had a generous spirit in welcoming refugees, helping them to adjust to life in Australia. Dorrigo was first settled by timber cutters; one of its early farming pioneers was Major Edward Parke. The town’s name was originally Don Dorrigo, and for many years it was fondly imagined that it was named after a Spanish general whom Major Parke fought alongside during the Peninsula War, which had Spain, Portugal and the United Kingdom fighting against the French Empire and Napoleonic Spain. However, subsequent research at the Spanish War Museum has revealed there is no record of any Don Dorrigo. I have seen two closely related explanations for the name Don Dorrigo. One is that it is a corruption of the Gumbaynggirr word Dunn Dorriga, meaning “tallowwood tree”. Tallowwood (Eucalyptus microcorys) is a common tree in New South Wales and Queensland which grows in forests near coastal areas, so named because its bark has a slightly greasy feel. It is one of the trees on which koalas feed, and its nectar is prized for making honey. More commonly it is said that the word dundorrigo meant “stringybark tree”; stringybark is the generic name for any eucalyptus tree which has thick fibrous bark. There are more woodsy associations for Dorrigo. The Dorrigo Plum (Endiandra introrsa) is a rare rainforest tree whose dark fruit resembles a plum, hence its name – it is in fact a member of the laurel family. The Dorrigo Pepper (Tasmannia stipitata) is a rainforest shrub which has fragrant leaves and dark blue berries; both leaves and fruit have a hot peppery flavour, and they are harvested as a seasoning. I have not been able to find any examples of Dorrigo in use as a person’s name, making this a genuinely unique choice. It is a “real name” because of the New South Wales town, and it is from the local Aboriginal language with connections to our native trees, and timber industry. Richard Flanagan’s award-winning novel gives it a distinguished literary history, and as other Australian Man Booker Prize winners have had their books turned into films, may become more accessible as a movie character’s name in the future. A possible issue with the character of Dorrigo Evans is that although he is a hero, he also has very human failings, and is a philanderer. I don’t know whether that would put people off using the name or not. Although Dorrigo would be very unusual, I have seen Australian boys called Django and Diego, which don’t sound too much different. Dorrigo is a way to get a fashionable -o ending, and even a slightly exotic feel, while still being familiar and distinctively Australian. Dorrigo received a respectable approval rating of 60%. 25% of people thought it was cool and different, but 15% saw it as ugly or unattractive. Nobody thought it was too much like Dorothy for a boy’s name.